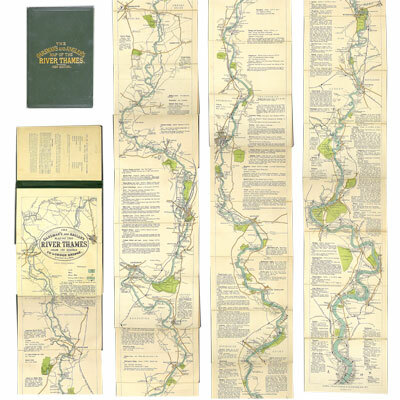 The Oarsman’s and Angler’s Map of the River Thames From Its Source to London Bridge. - E. G. Ravenstein F.R.G.S. 1909 - Edward Stanford, London - New Edition	A bright and near fine copy of this early map of the Thames, folding out to over eight feet in length (2.67m, 105”), cloth backed and housed in the original publisher’s green cloth covers titled in gilt. Beginning at Cirencester and Kemble, then passing through Cricklade, Kelmscott, Oxford, Reading, Henley, Maidenhead, ending at London Bridge, including details of locks, the charge to use them, bridges, towns and villages.